Financial institutions drain billions of dollars annually from their customers through abusive overdraft fee practices. Frequently marketed as a “customer service,” overdraft fees are charged when a customer’s account lacks sufficient funds to cover a transaction and the institution pays the transaction anyway. The institution then repays itself the value of the overdraft transactions and all accompanying fees from the consumer’s next incoming deposit. In doing so, the institution jumps ahead of any other planned transactions. Banks typically charge these fees on debit card point-of-sale (POS) transactions, ATM withdrawals, electronic bill payments, and paper checks. Some institutions have a far better policy on POS and ATM transactions by simply declining these transactions at no cost when accounts lack sufficient funds. But many other institutions continue charging $35 per debit card overdraft. 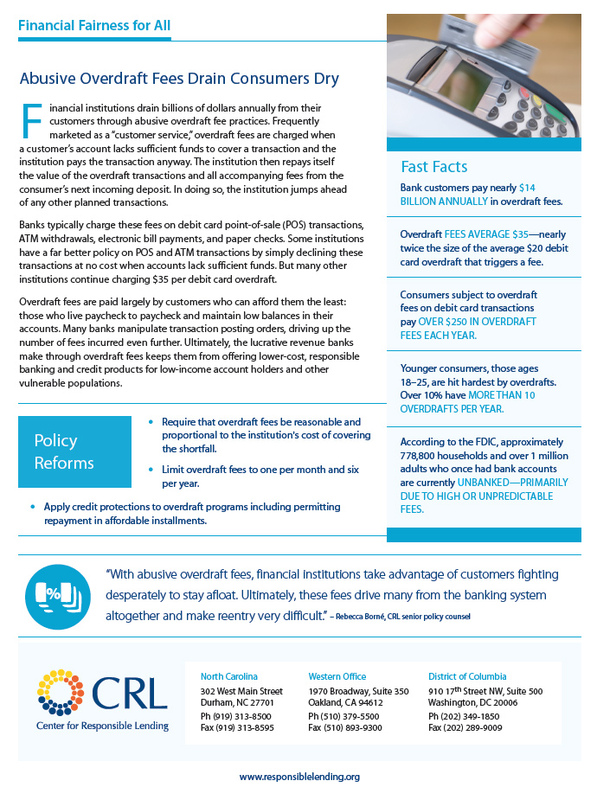 Download the overdraft fees factsheet.